The World’s Best Watch Illumination …period. Throughout the history of the wristwatch, designers have struggled with the best method to illuminate the watch face for easy viewing at night. Originally, radium paint was applied, but the radioactive side effects to the workers quickly made this unacceptable. Various phosphourescent compounds have been tried, but most remain visible only a short while in the dark. Electroluminescence was introduced in the ’80s, but has the disadvantages of reducing battery life and requiring a button press to activate. Tritium-filled luminous tubes entered the market in the ’90s, and while their multi-year illumination makes them a good choice, their relatively low brightness can be difficult to see in partially lit conditions, or immediately after moving from a brightly lit to a dark environment. Never Dark® is the first technology to combine the intense brightness of Superluminova with the multi-year longevity of tritium, providing optimal illumination under all lighting conditions. Because it can take up to 30 minutes for the human eye to fully adjust to the dark, Superluminova’s intense peak brightness makes a Never Dark® watch easily visible during that initial period. This can be even more important when moving repeatedly from light to dark (such as when going below deck on a boat during the day), as the Superluminova will continually recharge and the eye will not have time to adjust. 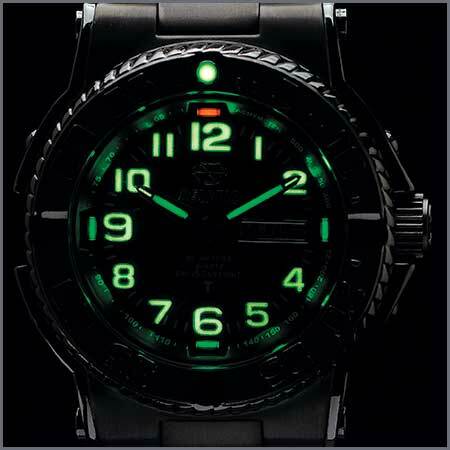 In situations where the watch will remain in the dark for many hours, the tritium will remain visible for years, even if the watch is never returned to the light. This graph illustrates the performance of each illumination source over time. 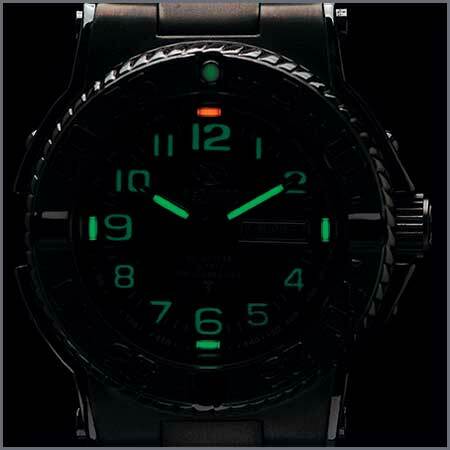 While tritium remains at a constant level, Superluminova gets extremely bright then fades over several hours, but recharges very quickly when re-exposed to light. Never Dark® is the only watch illumination to “self-adjust” to conditions, with a response curve similar to that of the human eye. At its peak, the glow of Superluminova is easily visible, even at dusk or in difficult, partially lit conditions. With a full charge, it produces five to ten times the light output of tritium. But, as that brightness fades, the tritium will continue to glow for at least ten years. 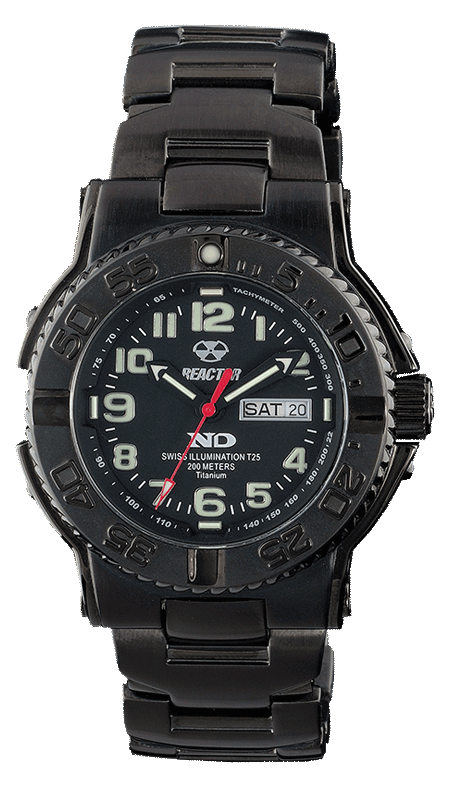 Unlike radioactive isotopes that have been used on watches in the past, tritium poses no health risk to the wearer or to the workers who assemble the watches. Tritium’s radioactive decay produces only weak beta particles that are contained completely within the sealed glass tubes. Even if exposed, the beta particles do not posess enough energy to penetrate the outer layer of human skin.